Mario Party 4 (マリオパーティ 4, Mario Pātī Fō?) is a Party game developed by Hudson Soft and published by Nintendo in North America on October 21, 2002. It was later released in Australia on November 3, 2002, in Japan on November 8, 2002, and in Europe on November 29, 2002. 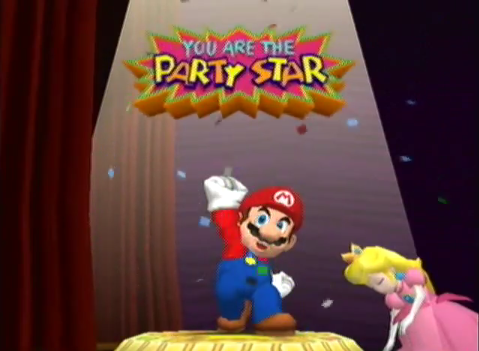 It is the fourth game in the Mario Party series and the first installment for the Nintendo GameCube. Mario and his friends are all standing around outside Princess Peach's Castle when suddenly, a giant floating bag approaches them. It begins to cast a shadow over the characters and the castle, and everyone is getting nervous. Suddenly, the bag opens, revealing a giant cube. Toad, Shy Guy, Boo, Goomba, and Koopa pop out from the cube and invite the characters to play with them in the Party Cube! The plot of Story Mode is that it is the chosen character's birthday. Each of the first five board hosts has a present for the character. However, the player won't receive the presents unless they can win each of the boards that the hosts have created. This page was last edited on 30 May 2014, at 19:26.